The iPhone 3GS has a horrible shallow curved Intensity Scale that washes its already low Contrast and poor Color Saturation from its small Color Gamut. The best compromise solution that we recommended in our Shoot-Out article was to make the Intensity Scale straight and slightly steeper than the Standard in order to boost Image Contrast and Color Saturation. That's what happened next with the iPhone 4 and iPad 2. The iPad 2 and iPhone 4 both have a steep but relatively straight and smooth Intensity Scale that partially compensates for the weak Color Gamut and color saturation. 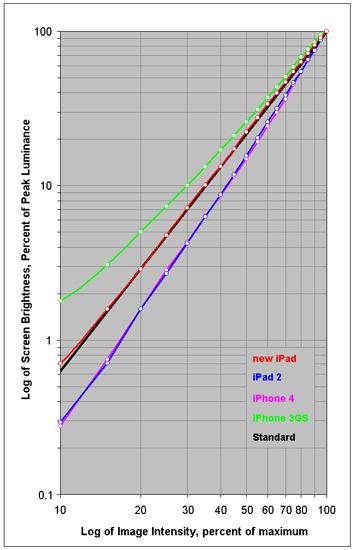 The new iPad has an accurate Standard Color Gamut so it no longer needs the benefits of a steep Intensity Scale. In order to get accurate Image Contrast and Colors it now needs to follow the Standard Intensity Scale, which it does very nicely.